Yesterday saw the launch of the new Mercedes and Ferrari cars – and we’ll have some more analysis on those later – but today saw the reveal of McLaren’s latest car, the MCL33. The first car of the new McLaren-Renault partnership, the MCL33 carries the hopes of double-world champion Fernando Alonso and Stoffel Vandoorne. The car also comes with great expectations, because for the last few years McLaren have claimed to have a great chassis, but one let down by an underpowered Honda engine. For the last few seasons we’ve seen the Renault do great things in the back of a Red Bull, and that means there’ll be no excuse for McLaren this year. As for the car? 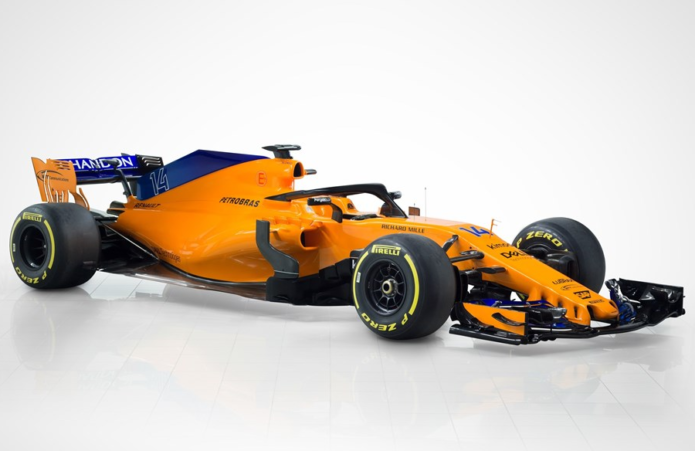 Due to a lack of sponsors, McLaren had the scope to listen to fans and bring back a classic Papaya orange livery – and it looks fantastic. If anything, the new design apes that of Alonso’s Indycar last year, but that’s no bad thing. First up, the new Sauber. Although the new car is powered by a current-year Ferrari engine, this year Sauber cars will take on the Alfa-Romeo name. The Sauber will race in a dashing red and white livery, but there’s other interesting aspects to the car, too. The C37, to use its codename, is one of the first cars that appears to take full advantage of the aerodynamic rules around the Halo device. This year, teams have a small amount of aerodynamic leeway to reduce the impact of the safety device. Sauber’s C37 features a small gap designed to condition and divert airflow once it leaves the Halo device. The 2018 Sauber will be driven by Marcus Ericsson and Charles Leclerc. This year Renault hopes to see its increased investment make even more of an impact, and with the impressive Carlos Sainz Jr and Nico Hulkenberg behind the wheel, there’s a good chance it’ll see better results. Like last year, the R.S.18 features a black and yellow livery. Called the RB14, the new Red Bull will be driven by Max Verstappen and Daniel Ricciardo, and represents one of earliest launches ever from the Milton Keynes-based team. Often, the team would only unveil its car on the morning of Barcelona testing. In 2018 the Red Bull will run Tag Heuer branded Renault engines, but will also feature Aston Martin in more prominence too. As for the livery? Red Bull says it’s a special edition livery, and the actual colours the car will be running with for the rest of the year will be unveiled in testing. Williams has unveiled its new car, and it looks pretty special. The first car designed with significant input from new technical officer Paddy Lowe, Williams’ 2018 car borrows a lot from both the Ferrari and Mercedes we saw last year. Interestingly, the FW41’s livery features a white and black trim, with the darker areas helping to obscure much of the new technology and features on the car. Before the launch, Lowe said ‘quite substantial changes’ will be made to key area of the car’s philosophy. And he’s probably right, the FW40 only finished fifth in the constructors’ championship last year – making it one of the most disappointing campaigns in a while. The driver line-up is changing too; with Felippe Massa retiring again, Lance Stroll is now driving alongside Sergey Sirotkin – who also brings in a good amount of sponsorship money. Just like last year, Mercedes will unveil its latest challenger – called the W09 – at Silverstone for a shakedown/ filming day. And just like last year, Mercedes will retain the services of Valtteri Bottas and Lewis Hamilton, too. With the rules staying relatively similar to last year, Mercedes will look to carry its advantage over its rivals into 2018 – but with diminishing returns affecting every team, it’s possible the margin over other cars could be reduced. Mercedes has also teased us with a video of its 2018 challenger, the W09, firing up. There’s not actually much to see in the new video – we’ll have to wait for the car’s launch on 22 February to see more – but we do see the car’s exhaust pipe and two wastegate pipes. And we get to hear it too. Ferrari has opted for an online launch, so won’t actually be showing its new car anywhere in particular. It’s also keeping the same pairing as last year, so you’ll see Kimi Raikkonen teaming up with Sebastian Vettel. To drum up anticipation, the team from Maranello has revealed audio of its next car starting. Just like the footage from Mercedes, which also released footage of its next car starting, the video doesn’t show much besides the exhaust and wastegates of the engine. As expected, Ferrari is being very secretive with its new car, but we’ll find out exactly what it looks like on Thursday next week. This year’s cars will look pretty much the same as last year’s with the caveat of two small changes: Shark fins, the large boards attached to the car’s engine covers are gone for this year, and the controversial new Halo system will be installed to every racer in 2018, too. The engine rules aren’t that different to last year’s with the only difference being the amount of engines the teams can use throughout the season. Last year, drivers had an allocation of four power units each per season, and now that’s been reduced to just three. It’s a move that was originally designed to save money, but according to Mercedes’ engine boss Andy Cowell, it’s meant the development of an all-new engine, and the construction of up to one hundred possible test units. F1 2018: what is the Halo? Brought in to reduce the risk of head injuries after incidents involving Jules Bianchi and before that, Felippe Massa, the Halo device is essentially a metal ring that floats above the driver’s head – hopefully protecting them from debris. Although it’s not been favoured by fans, teams or drivers, the FIA forced the new safety system through late last year, and that means it’ll be present on every car on the grid from the first race of 2018. However, despite F1 shooting for a new, fan-friendly image, it’s actually revealed nothing about what the Halo is, how it works and the rules and challenges around it. Instead, Mercedes and its new technical director James Allison have explained everything you need to know about the new Halo system. You can watch their video below. According to Allison, the relatively late decision to include the system this year has resulted in a serious challenge for teams, with the weight of the titanium device proving to be an issue. Teams have also had to strengthen the chassis of the car to make sure the Halo can withstand the weight of a double-decker bus. Finally, Allison explains that the Halo can be modified for aero reasons, with each team using a fairing to reduce the wake of the device, and hopefully stop it interfering with the aero surfaces on the rest of the car – as well as the engine air intake. 10 Best True Wireless Earphones of 2019 – Which Is Right For You?